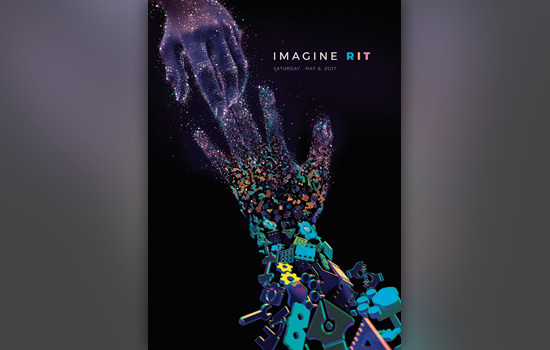 A design of two hands reaching for each other—one of them human, one built from bits of technical parts—is the winning entry from this year’s Imagine RIT: Innovation and Creativity Festival poster contest. Riley Yankowich, a third-year new media design student from Deerfield Beach, Fla., created the image and will receive $500 in Tiger Bucks as her prize. Five thousand 14-by-20-inch copies of her design will be printed and distributed to visitors for free outside The Wallace Center during the festival on May 6. She entered the contest as a class project, never thinking her design would be selected. Yankowich had four weeks to complete the design, which included an all-nighter towards the deadline when she used Photoshop and touched up 3D-rendered icons on the lower hand in her design. Nearly 50 entries were received for the contest. Runner up was a design by Amy Pham, a new media design major from Sunnyvale, Calif., who designed an image of RIT President Bill Destler’s head unscrewed, allowing items such as a joystick, Rubik’s Cube, hockey puck, gears and a banjo to pop out.